The Challenger disaster of January, 1986 was a tremendous loss for NASA and for the United States in many ways. The science project of 4-H alumnus (and Purdue University senior) John C. Vellinger was part of the payload aboard the ill-fated space craft. The science project, “Chix in Space,” was lost. Vellinger had been working on the chick embryo project since he was a ninth-grade 4-H member. The experiment consisted of a special incubator designed to cradle the fertile eggs during their journey. Vellinger’s experience in wiring and building circuits as a 4-H electric energy project member was valuable in his work designing and building the incubator. The idea for the space chicks project began to take shape when Vellinger was a student at Tecumseh Junior High School in Lafayette, Indiana. He entered a national contest sponsored by NASA and the National Science Teachers Association while still in high school as an eighth grader. Not winning that first contest, Vellinger redesigned the project several times before succeeding in getting it selected at the national level on the third try in 1983. After his first year at Purdue in 1985, NASA arranged for mentorship by Mark Deuser, an engineer who was working for Kentucky Fried Chicken, the corporation that sponsored the $50,000 incubation project. On the challenger flight, the experiment was to be monitored in-flight by S. Christa McAuliffe, who would have been the first schoolteacher in space. The project consisted of carrying chick embryos at two different stages of development into the weightlessness of space and comparing them against a control group. After the shuttle accident, Vellinger and Deuser carried on with NASA on development of the hardware and integration for Student Experiment (SE) 83-9 Chicken Embryo Development in space a.k.a. 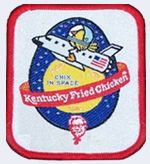 “Chix in Space.” The experiment finally reached its goal when it went into space on a Discovery Mission STS-29 in 1989. Of those incubated for the full term, in the young embryo group, not a single egg hatched, while all of the eight more mature eggs, subjected to the nine-day pre-incubation on Earth, hatched and proved to be viable. Dissection revealed that in the younger embryos, development ceased at varied stages during exposure to microgravity conditions aboard the space craft. After this pilot experiment, NASA scientists launched chicken embryos again in late 1992 aboard Endeavor STS-47 for collaborative study with Japan, and the research of chicken embryos in space is ongoing worldwide. For NASA, the “Chix in Space” hardware served as the prototype for additional space embryotic studies. John Vellinger and Mark Deuser later went on to co-found IKOTECH, a company with design teams which develop and provide equipment for life science experiments on space shuttle missions and other commercial and government applications. This entry was posted in History and tagged Chix in Space, John C Vellinger by Larry Krug. Bookmark the permalink.